aGENDA is a unique application combining our web interface with iOS™ or Android™ mobile devices, creating a powerful dispatch and task management system that will change the way you do business! 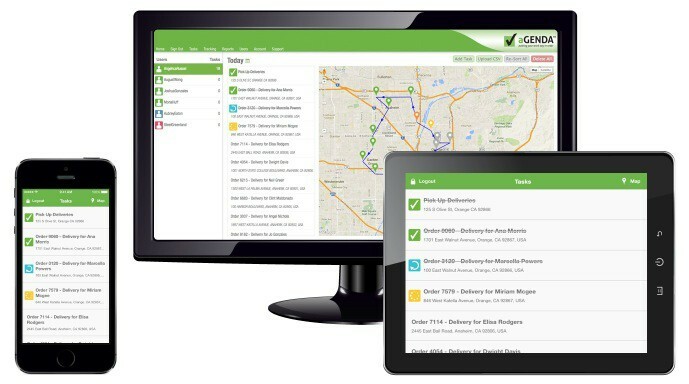 aGENDA is all you need for efficient route optimization, navigation, tracking, task management and reporting while eliminating paperwork, resulting in massive cost savings. We've been using aGENDA® for the past year and are completely amazed at how it's changed the way we run our business. We have a fleet of over 60 trucks and have calculated our first year's savings to be over $900,000 and the succeeding 2 years savings to be over a million dollars each year - that's over 3 million dollars in savings in just three short years! Any other business using mobile employees!